On my website www.europe-business-contacts.eu the button of See more news, doesnt direct. It says to many directions. But i did not change anything. After cache the problem is still there. I cant seem to find what it is. Do you have suggestions? 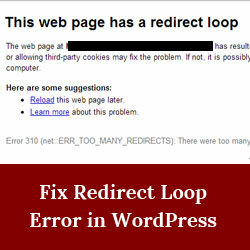 Are you getting too many redirects or redirect loop error on your WordPress site? Here is how to fix Error too many redirects issue in WordPress. Perfect, in settings adjusting in general the url by deleting the www. fixed the problem. Google prefixes www. or not itself. Addition to this question. How can i change the see all our news. Now it directs to one post, and people can go to a former or last post with a button. I rather have that they see all the posts in thumbnail or something. Please try to set Posts page in Appearance → Customize → Homepage Settings section, and see if it helps (that button should link to selected blog page).